Hiya pals! I’m still recovering from my recent eyeball bugaboos, so please be patient as I slowly get the hamster-wheels running on the ol’ Progressive Ruin website again. In case you missed it, I did have a couple of smaller posts over the last few days, and I think that may be par for the course for a little while as my vision continues to defog. So you’re not rid of me just yet. One thing I wanted to post about last week is the fact that the new DC solicitations include the beginning of the direct market-available reprintings of the new content from the Walmart-exclusive 100-page giants. My thought was that they were probably going to collect those stories into trade paperbacks, but nope, they’re going for periodicals, each containing two installments from the giants. 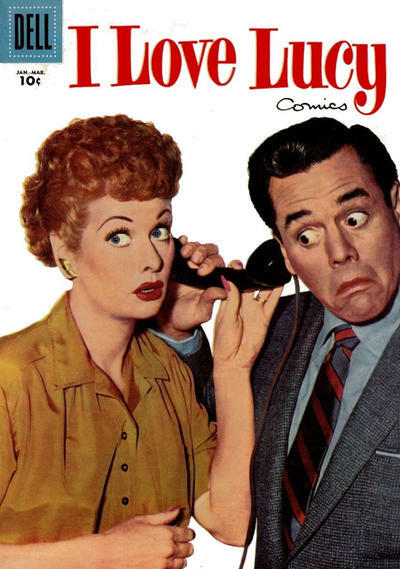 $4.99 cover-priced periodicals, natch, but What Can You Do? I’m sure the trade will follow eventually. 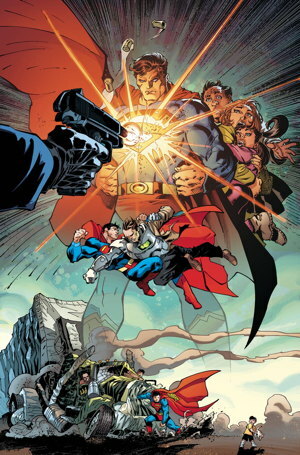 The Superman one (cover pictured here in the post somewhere) is titled Superman: Up in The Sky , and the Batman one is Batman Universe . I particularly like the title of the Superman book, and quite frankly I’m surprised it hasn’t been used yet. Or maybe it has, I don’t know, there are lots of Superman comics. Batman Universe is a pretty good title, too. 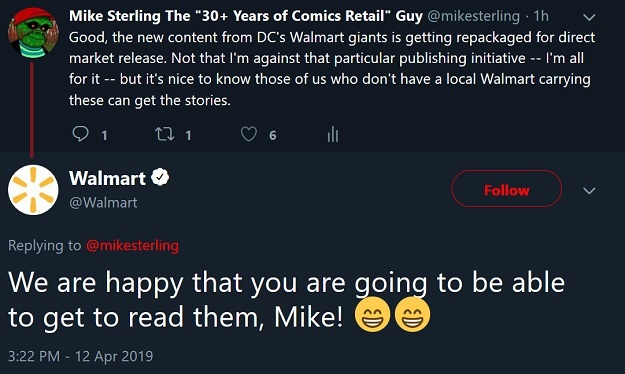 Hopefully the eventual collection of the Swamp Thing stories from the Walmart giants will be called…what? Swamp Thing: Out of the Muck ? Swamp Thing: Born on the Bayou ? Swamp Thing: Gotta Defuse It Before… ? …I bet they go wtih Roots of the Swamp Thing . Y’know, again. THEIR EYES ARE EVERYWHERE. Though I notice they didn’t comment on my rather cynical observation from a couple of years prior. …Yeah, that’s a tad snarky. Not as snarky as this, but still. Okay, enough of these shenangians…time to return my eyes to th evault. I’ll be back midweek. Thanks for sticking around and I’ll see — well, “see” — you then. Just thought I’d share a picture of this CD from my collection with you all today. …to let you know that my store sponsored this week’s episode of War Rocket Ajax. 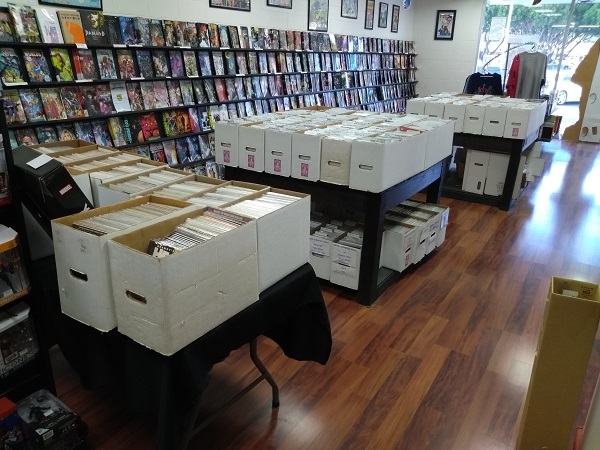 Hear pals Matt ‘n’ Chris sing the praises of Sterling Silver Comics! …It was definitely nice to hear after a couple of rough eyeball days, so that was good timing! Hiya pals. I’m taking this week off from Progresive Ruining to give my post-surgery eyeballs more of a chance to rest in the evenings. I should be back the following Monday. Thanks for reading, and I’ll see you soon. No, really, I don’t have any more of these. Honest. So here’s a heck of a thing…I’ve been selling a number of sports related magazines on consignment on the eBays, but the person ifor whom I am selling said items brought in something fairly unusual. 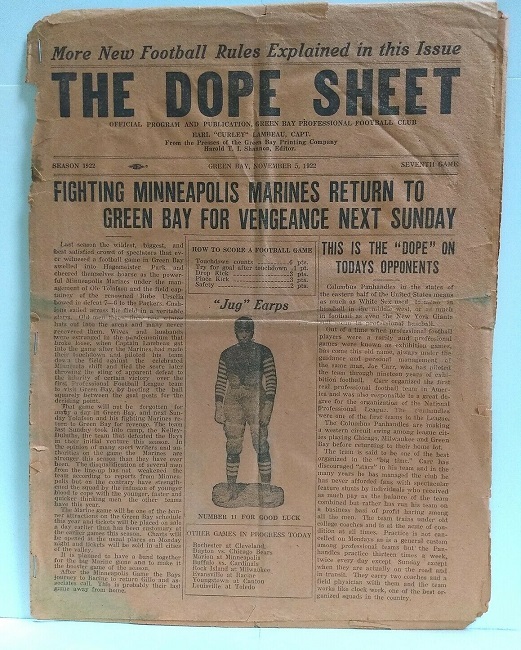 Pictured above is a program for a Green Bay Packers game, dated November 5th, 1922. As the owner of the item noted in his description, it’s just three years short of being an antique. I should say “former owner,” because that sucker is sold and way out of my hands, and there ain’t no more coming of similar vintage, so hold those phone calls and emails, friends. Now, when this item was originally purchased by the person I was selling this for, he paid about a thousand dollars for it back in the 1980s. When we listed it on eBay, we started it off with a 99-cent opening bid, with a $2,000 Buy-It-Now price. Within a day of listing it, I started getting phone calls. Calls from people offering anywhere from three to five thousand for the item. I, and the owner of the item, found this to be an unexpected development. However, given our own disinclination to end an eBay auction early like that, plus wondering what it would eventually go for given that we were getting offers like that in the first day, we just let the auction ride. Well, it turns out someone should have jumped on that two grand Buy-It-Now right away because it ended up going for just over $5,200. Yes, that’s a little bit mindblowing. I only keep a small-ish portion of that, but still, that was something else. I have an eBay app on my phone that gives off a little noise when I get a bid, or an item is sold, or what have you, and in the last, oh, two minutes of the auction’s duration, my phone just wouldn’t shut up what with all the under-the-wire bids that program was receiving. Anyway, it was paid for right quick (with a personal check, to avoid the PayPal fees but also required me holding the item while I waited for the payment to clear), and it was shipped off to its new happy home, leaving behind a couple of happy sellers. …I believe I’ve noted, either here or on the Twitters, that in regards to mail order, it generally requires the same amount of time investment in preparing a $1 item or a $100 item for shipment, in terms of what I decide to list or not list. As you may not be surprised to hear, a $5000+ item takes significantly longer to prepare, simply out of sheer paranoia. This program isn’t significantly different from other items I’ve sent into the tender mercies of the postal office…I’ve shipped out lots of promotional materials, flyers and posters and other goodies of similar dimensions, and just sandwiching those between two sturdy pieces of cardboard, taping ’em down, wrapping them in the proper envelope, and that’s that. This item got wrapped inside multiple bags, sandwiched between multiple pieces of thick cardboard, wrapped in bubble wrap, and shipped in a box. With insurance. And tracking. And signature confirmation. It arrived fine, by the way. I was reasonably certain it would show up in one piece, but one can’t help but worry with something that’s 1) irreplaceable, and 2) a tad pricy. I don’t think I exhaled loudly and patted my sweat-beaded forehead with a kerchief like an old timey sitcom character when I found out it arrived safely, but I certainly thought about it. 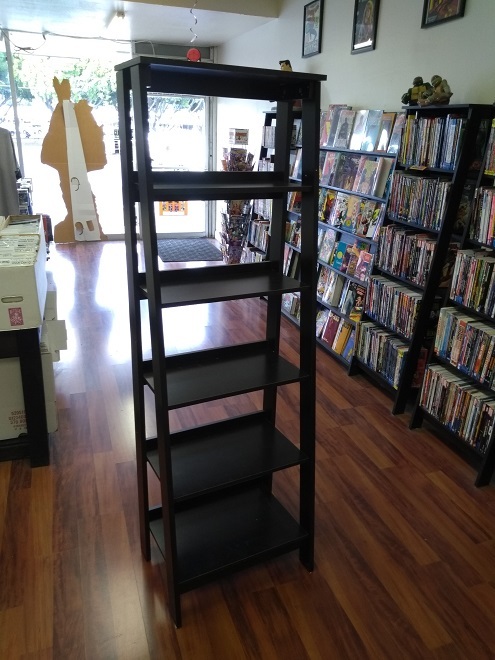 No real good reason to bring that all up here, aside from maybe showing you some odd item you probably haven’t seen before, even if it’s not comic book related, or giving you an idea of the kind of stuff I do as a Big Time Funnybook Shop Owner. And yes, maybe to brag just a little. On one hand, I’d love if every eBay sale was like this, but on the other hand, the stress would probably kill me, so perhaps it’s for the best. Third time’s the charm, with any luck, and today should be my final of a series of eye surgeries…barring complications, of course! It’s just a routine procedure, so they tell me, and I should be up and around and back to work tomorrow, and with any luck I’ll return to my blogging shenanigans here on Wednesday. So, think good thoughts about my eyeball and I should see you soon…with both eyes, finally!